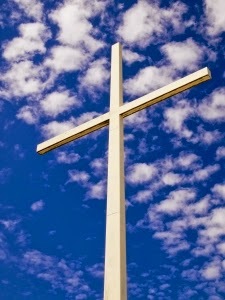 A different heresy: Good Friday: We look up at the cross. What do we see? Good Friday: We look up at the cross. What do we see? The scene played out at the cross is a scene which, despite its foreignness to us here at St Lucia, had been played out thousands of times before Jesus ever got there. Friends and family watching on as a loved one is executed by a foreign power. It was the way of an occupying force asserting its authority. For the Roman Empire such a death as Jesus ' death was more common than we modern Christians would like to admit. We are so used to contemplating Jesus death as unique and special. Under the cross we find the menagerie of humanity: the executioner, the guards and the gamblers; the mourners, the friends, the disciples and the mother; the passerby and the innocent bystander, for the crosses of Rome were always in public places. Crucifixion was a humiliation and a warning to others. Yet as much as this scene had been played out a thousand times before, and in different ways a thousand times a million times since, on this day we are drawn to remember this particular death, of this particular man. We come to stand under his cross and in so doing to seek to understand: to understand the meaning of our lives, to understand the meaning of death, to understand the meaning of God. We Christians have spent 2000 years theologising this moment, puzzling over the concepts of suffering and atonement, of grace and of love. This is not surprising given the way the gospel writers, like John, retell the story, filling it with imagery and mystery. Yet, on that day standing under the cross, I do not think Mary the wife of Clopas and Mary Magdalene, nor Jesus own mother and the beloved disciple, were worrying about the theological implications of the event. Here in this moment they beheld: the pain and suffering of someone they loved; they mourned for him; they sought to comfort him with their presence; they may have wondered at the sheer brutality of the event and the callous behaviour of the soldiers; they could also have wondered about their own mortality and even feared for their own lives by simply being there. Standing alongside these women and men, with hearts breaking at the suffering, we too stand with those gathered around the world looking up at the cross wondering where is God in the midst of these terrible things. Where is God in the midst of suffering? Where is God in the moment of death? This scene of suffering and death is not foreign to most of us. We have seen the atrocities of our oh-so-wise humanity, we have seen the concentration camps, the killing fields, the massacres and the barbarity. We have seen the spectre of death as our own loved ones have died, as Dylan Thomas wrote, raging against the dying of the light. It is because of the utter humanity of the event, of both the barbarity of human behaviour alongside the depth of suffering it causes, that the gospel writers so deeply reflected on this moment and filled it with symbolism as they too wondered where God was in this event. So, as we stand under the cross on this day we hear and reflect on the seven sayings of Jesus which come to us, revealing God's loving presence in this moment of confusion. Looking up, from under the cross, it is difficult to fathom the suffering of Jesus and his words ‘I thirst’ remind us that here hangs a man, a man deeply deprived and wounded. It is easy to ask the question, where is God in all of this? God is with us! God does not forsake or abandon us in, neither in life nor in death! Just as the gospel writers show to us God present in the moments of suffering and even beyond death, they also reveal in Jesus words his concern for the life of those who go on. In the scene in John’s gospel Jesus is renewing community, even from the cross Jesus is reconciling and making new. To his mother and his beloved disciples he says,” Woman, behold your son. Behold your mother.” God is with us as new communities of life and hope are built. God is reaching out in grace towards humanity and Jesus is God’s love enfleshed. Here is the culmination of God’s story we find in the scriptures. A story of a God who pursues humanity in love to the very end and commits not to leaving Jesus in his suffering: nor might I say you and I. Here is a God that does not act in retribution and wrath but in compassion and mercy, and in love and grace, as Jesus suffers the consequences of human decisions when we are faced with the unknown and when we are caused to become fearful. Did Jesus actually say any of these things? It is beyond our proving. Do these words help understand this moment? Maybe, but only inasmuch as we understand anything about the mystery of Jesus’ life and death! This morning we stand under the cross. We look up. What do we see? What do you see? As much confusion as there may be about what Jesus death means and what is occurring one thing I hold on to is that the gospel writers were at pains to let us know God and God’s love were palpably present. God’s love for Jesus, God’s love the creation and God’s love for each one of us who is made to live in community with God and one another. We stand under the cross. We look up. What do we see? What do you see? This is a really nice reflection about Good Friday. Thanks for writing this. Good Friday commemorates the day Jesus died. n It is considered good in Christianity because it shows the lengths to which God goes to express God's love for us.